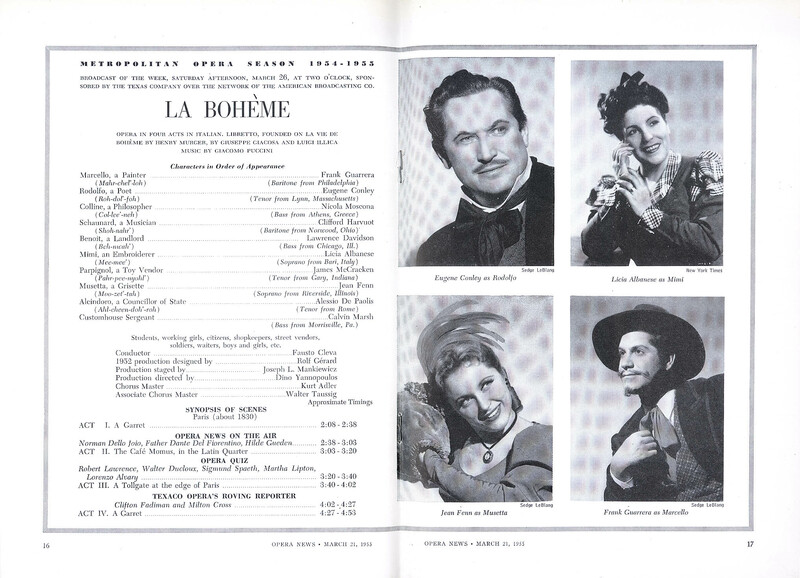 LA BOHÈME:Puccini Original Air Date: 03/26/1955 Cleva; Albanese, Conley, Fenn, Guarrera, Moscona SID.19150102 Albanese broadcasts her Mimi four times in the 50s, and her tenor partners are Tucker, DiStefano, Conley, and Bergonzi. The DiStefano and … Continue reading "LA BOHÈME"
LA BOHÈME:Puccini Original Air Date: 03/26/1955 Cleva; Albanese, Conley, Fenn, Guarrera, Moscona SID.19150318 Albanese broadcasts her Mimi four times in the 50s, and her tenor partners are Tucker, DiStefano, Conley, and Bergonzi. The DiStefano and … Continue reading "LA BOHÈME"
LA BOHÈME:Puccini Original Air Date: 03/26/1955 Cleva; Albanese, Conley, Fenn, Guarrera, Moscona SID.19150534 Albanese broadcasts her Mimi four times in the 50s, and her tenor partners are Tucker, DiStefano, Conley, and Bergonzi. The DiStefano and … Continue reading "LA BOHÈME"